In addition to his annual Bensen booth, which this year featured a parade of golden-hued upholstered furniture atop a matching “carpet” that bisected the space and extended up a wall, founder Niels Bendtsen unveiled Yumi, a four-piece chair and table collection for Italian brand Moroso, the Vancouver-based designer and retailer’s first collaboration with the company. Consisting of a lounge chair (available in large and small versions), a coffee table (available in three heights and diameters) and a dining chair, the pieces in the series are defined by their fluid shapes and sophisticated geometry. The coffee table, for instance, rests on three slender legs and is held together by three linked semicircles and a circular glass top. The legs and braces come in three colours: red, yellow and slate. In the case of the seats, which boast angled profiles and unbroken tubular frames, the four legs and tube structure support a padded seat cushion and a wraparound back that can be padded like the seat or woven to produce a “sunray” effect. 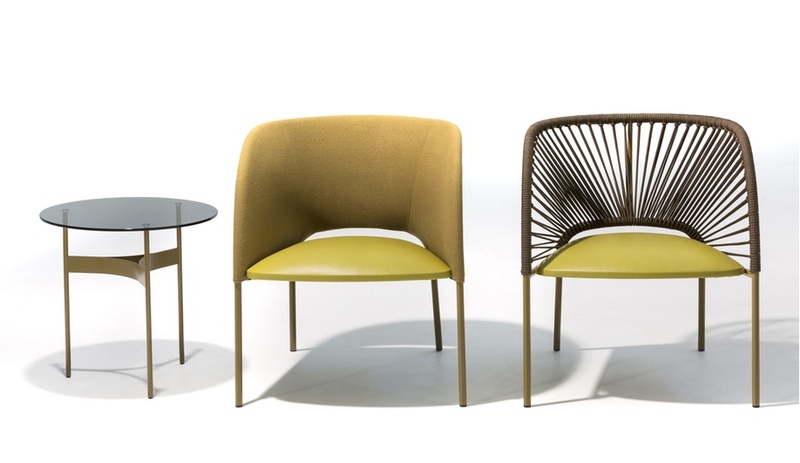 Bendtsen’s collection, says Moroso, constitutes “a neat representation of a harmonious bent bow.” It might also be described as a happy intermingling of West Coast ingenuity and Italian flair. True to his multi-hyphenate nature, Vancouver- and Berlin-based Omer Arbel took a two-pronged approach to showcase his latest endeavour during Milan Design Week: The Bocci founder and creative director unveiled his recently established accessories brand, OAO Works, via two shows, one scheduled and one secret. First up was his participation in the group exhibition UNSIGHTED – produced by 5VIE and curated by a fellow Canadian, expat Nicolas Bellavance-Lecompte – where he presented his 84.2 Copper Mesh Glass vase series. The eye-catching vessels have a curious aesthetic thanks to a thin copper mesh encased in thick layers of glass, with organically formed folds and pleats in the metal giving the hefty pieces depth and an inferred texture. 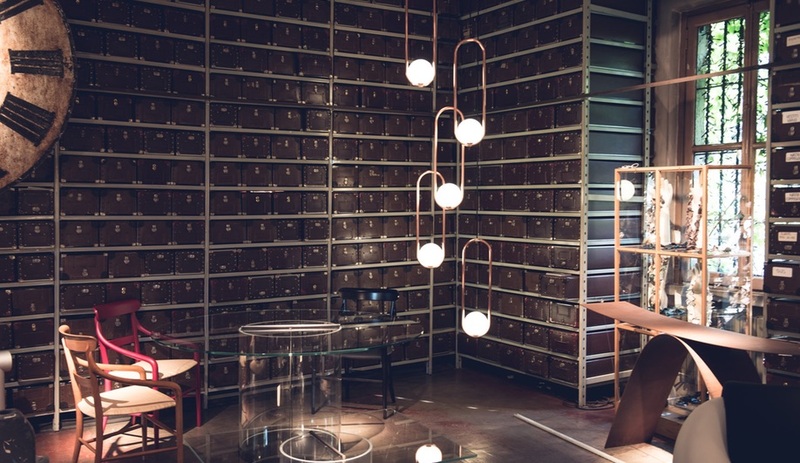 Once the madness of Milan Design Week had subsided, Arbel deployed his second initiative at the Mercatone dell’Antiquariato, a popular, two-kilometre-long antiques market in the city. 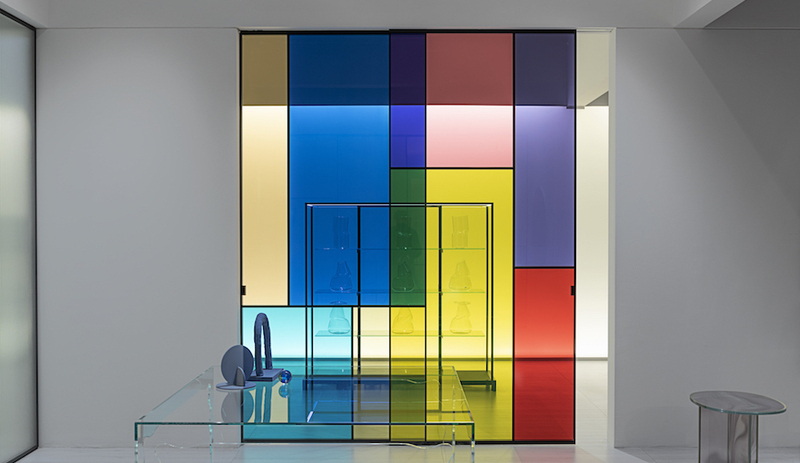 Mixed in with the wares of an established trader were his 31.3 Polygon Glassware, a series of 31 rainbow-tinted blown- and cast-glass elements. No two pieces are alike in form or colour, but complement each other in both. 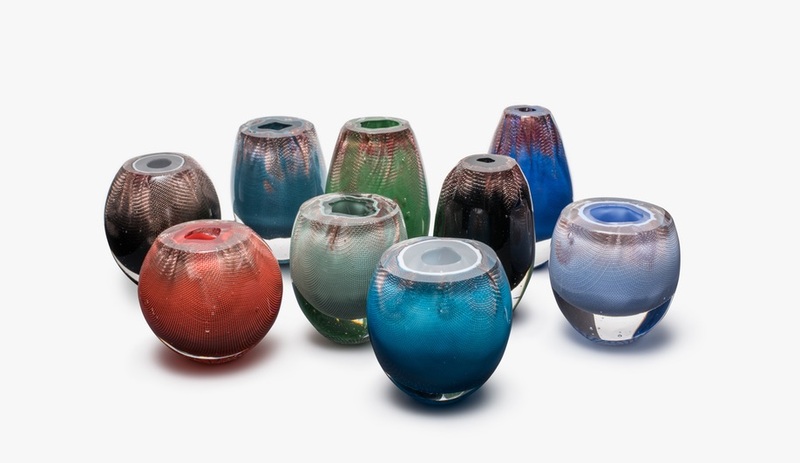 The stunning hues were achieved through an ancient Czech glassmaking technique that uses unique ingredients like animal bones. 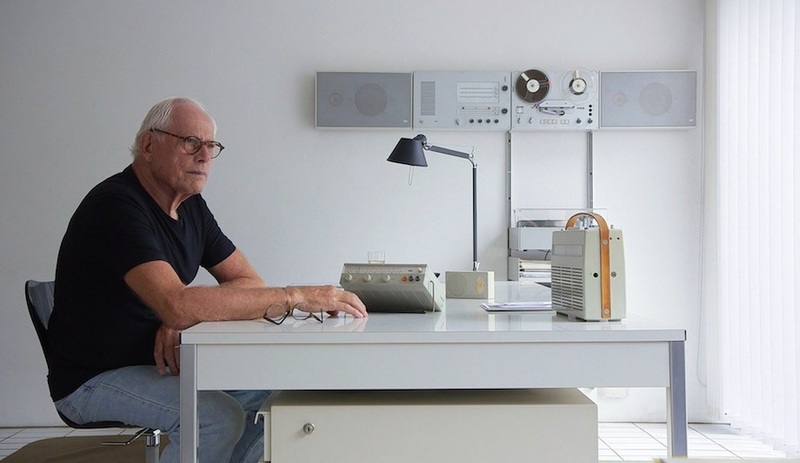 Describing his new label as a “loose portfolio of objects, curiosities and ideas,” Abrel plans to use it as an outlet to further explore themes, material investigation, new narratives and collaborations. It will soon include sculptural beeswax candles and otherworldly metal jewellery in the mix. 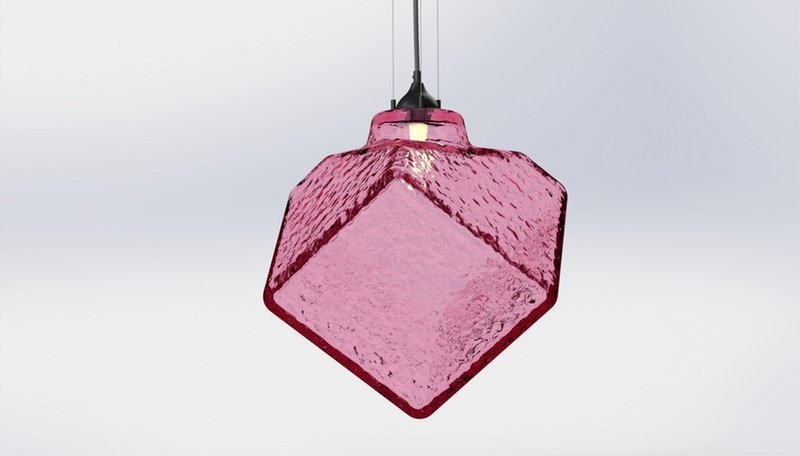 For only his second showing during Milan Design Week, Vancouver lighting designer Matthew McCormick once again secured a highly coveted spot – an installation of his newest creation, the Mila pendant, occupied a sizeable space among the curations at Rossana Orlandi, the eponymous gallery/boutique of the design-world influencer. A former snowboarder, the Toronto native’s aesthetic treads the line between edgy and elegant. Mila is no exception. A measured composition of two elements, the light balances a delicate hand-blown glass sphere within an extended loop of steel finished in brushed brass (other standard finishes include brushed copper, textured white and satin black). McCormick has hidden all wires and technical components inside the metal frame, a move that furthers Mila’s sleek and simple appeal. When speaking to Azure earlier this year about his burgeoning studio, McCormick noted that “Canada, especially Vancouver, is becoming a bit of a hotbed for design.” With Canada’s strong presence during the main industry gathering of the year, it seems he’s not alone in that view. The kings of Canadian chic confronted a few monsters for Czech glassmaker Lasvit’s exhibition of the same name, but their manifestations were decidedly less scary than spirited. 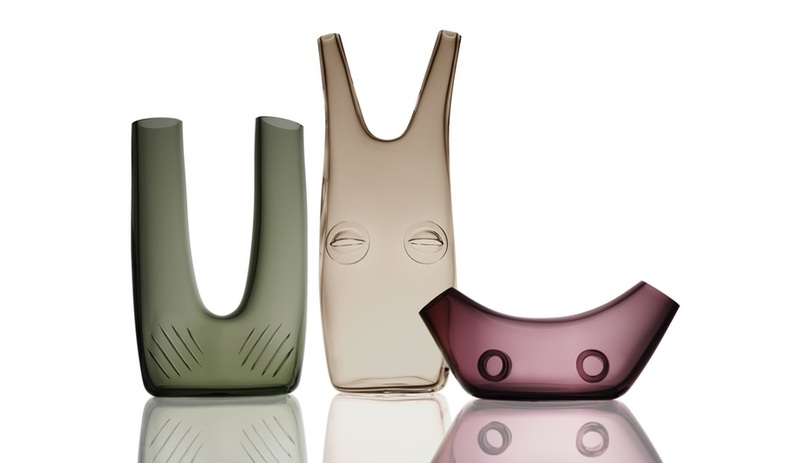 For their contribution to the Monsters show at Teatro Geralamo in central Milan, Toronto-based designers George Yabu and Glenn Pushelberg turned to Japanese folklore, producing three tsukumogami – material objects traditionally believed to have souls – that look like avant-garde wine decanters with eyes. According to Japanese legend, an object that serves a person for a century or more acquires a soul. Such objects are known as tsukumogami – inanimate items infused with a discernible spirit. The names given by Yabu Pushelberg to their versions – Shiin, Uro-Uro and Jiro-Jiro – correspond to the identities of prospective holders. Shiin, for instance, is the silent type, while Uro-uro is “the one who would like to roam without noise.” Jiro-Jiro watches viewers intently. “Not only are the words themselves fun and have creepy/curious meanings, but we like the idea that they each personify the object,” say the designers. How, though, can Jiro-Jiro and his cohorts watch anyone? “Each glass vessel is subtly transformed with depressions, implying the watchful eyes of each object, giving the impression that the object is the viewer,” the designers explain. It’s a testament to Yabu Pushelberg’s design skill that the expressions in those eyes are so nuanced, ranging from playful to sinister, mischievous to malicious.